There are a number of factors that go into making a tree planting successful, including the planting of Ponderosa Pine. The following are some of the things to consider that will help your tree grow up happy and healthy. One of the first things to ask yourself is whether or not your tree, regardless of species, will have enough room when it is mature in the location you intend to plant it. The cute little seedling you have in your hand may or may not fit so close to your house, or in that bare spot you've been wanting to fill under those powerlines along your back fence. You and your tree are best off if it is in the right location for its size. It's a bad idea to plant a big species of tree and have to prune it to keep it small. Be sure to read tags and discuss your planting space with nursery staff prior to purchasing trees, you can also get great information from the Spokane County Conservation District and a number of books on plants such as the Sunset Western Garden Book. Utility companies have the right to protect the transmission lines they own going through, or past, your property. Typically, there are a limited number of tree species allowed within a utility right-of-way. These trees only grow to a short height, stopping clear of the overhead lines. 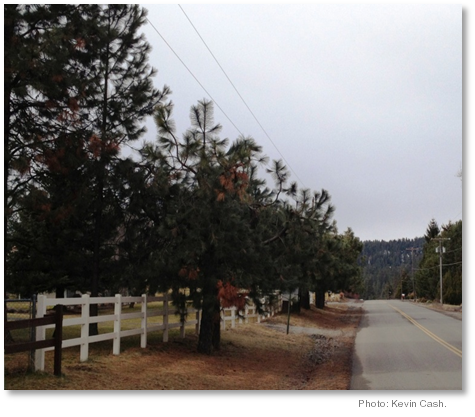 The Avista Utility Company provides a list of trees on their website that they consider power line compatible. Tree species that grow into the lines will be trimmed or are removed by the utility company. Avista has additional usefull information on their Vegetation Management website. As with all projects that include digging, we suggest you CALL BEFORE YOU DIG (on your phone dial 811) and have a utility location service verify you're not about to dig into a gas line or fiber optic cable in that "perfect spot for a tree". The service is free but repairs aren't! You will also want to make sure you don't plant a tree on top of an underground line that the tree can damage with future root growth or require removal of the tree if the line needed maintenance. A large tree species planted too close to a building can cause harm to the structure and the tree as well. In addition to limbs, or even the trunk, coming in contact with siding and eves, roots can, in some cases, damage a building's foundation. If your home has a septic system, avoid planting trees near underground tanks and leach fields. If you have property on a street corner or your property includes or borders a driveway, there are sightlines that need to be maintained for safe driving conditions. Each municipality has seperate guidelines on landscaping adjacent to street and driveway intersections. As an example, here is a link to the City of Spokane Vegetation and Traffic Safety Guidelines in PDF format (1999). Keep in mind that evergreen trees, such as Ponderosa Pine, will provide shade year round. We suggest that you avoid planting evergreen trees where winter ice and snow will be an issue when it's shaded by trees. Ponderosa Pine are a City of Spokane approved street tree but it would be a detrimental shade source for streets in areas of the city that don't readily melt off without sunlight. (e.g. South Hill, Five Mile, Indian Trail, etc.). This is less of an issue on the Valley floor. Ponderosa Pine are extremely sensitive to their root ball drying out during their establishment period. Supplemental watering is a must for Ponderosa larger than seedling plug size. Supplemental watering should be for at least two years. Professional arborists suggest a minimum of three years and an additional year for every two inches of caliper. 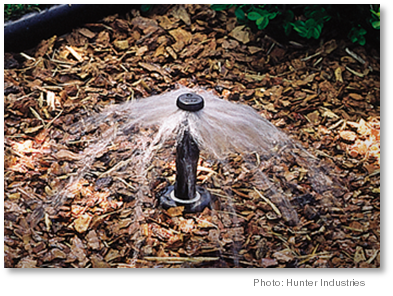 Irrigation Systems that provide water with spray heads are great for shrubs and lawns but a tree requiring supplemental watering needs more than what spray heads can provide. If you have newly planted Ponderosa Pine (or any other large tree species) in your landscape, we suggest providing them extra water in a way that saturates the soil around and through the root ball. Install separate bubbler zones for your trees. Provide temporary irrigation to the trees separate from the spray zones. Hand watering the root ball area with a garden hose. 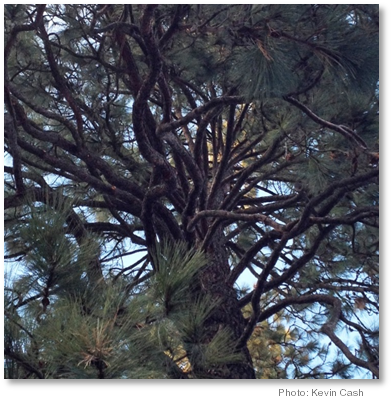 People typically think of deciduous trees when you mention pruning but Ponderosa Pine can be pruned too. As most evergreen trees mature they loose their needles and smaller branches closest to the trunk, and keep their newest green needles on their exterior branches. Ponderosa are very picturesque when their dead material has been removed. Pruning can be done yourself but we suggest hiring a certified arborist, especially when the trees being trimmed are large and require climbing gear to safely scale. If you don't have an arborist that you've hired before and are in need, we suggest you contact the Spokane County Conservation District for a list of local arborists.